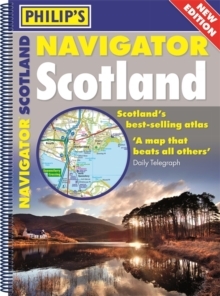 PHILIP'S NAVIGATOR SCOTLAND - THE BEST-SELLING ATLAS OF SCOTLAND'A map that beats all others' The Daily Telegraph'Scale, accuracy and clarity are without parallel' Driving Magazine'No.1 in the UK for clear maps' Independent research survey- Fully updated mapping at a scale of 1.5 miles to 1 inch = 1:100,000 (3 miles to 1 inch = 1:200,000 for Northern Scotland) - No other road atlas of Scotland offers this level of detail and clarity- 15-page 'best places to visit' section, including sights and walks- Practical A4 format with spiral binding- 13 indexed town-centre maps- Exceptional road detail, from motorways to country lanes, with every junction, roundabout and slip-road shown- Thousands of individually named farms, houses and hamletsNavigator Scotland offers so much more than road maps: hundreds of individually named farms, houses and hamlets, airports, airfields, stations, ferries, canals, marinas, tourist information centres, and a wide range of places of interest. The atlas has a comprehensive index and includes indexed town plans of major regional centres. The front of the atlas contains a 15-page guide to regional leisure facilities and listings of a wide variety of activities from abseiling to yachting. The atlas is ideal for touring with its large scale and wealth of travel information. The exceptional detail also makes the atlas ideal for local business use.